Here's another shout out for a recent handmade purchase. 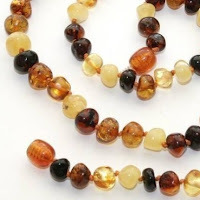 This amber teething necklace from Natural Inspirations was brilliant. I am always hopeful, yet skeptical, about natural remedies. And, while I don't have a lot of data to back me up here, I am convinced this made a huge difference while J was teething. Over a 10 day period she got all four of her front teeth in. She was crazy fussy and clingy, and within 20 minutes of putting on her necklace, she was more of her cheerful self. I had worried about the safety of a baby wearing a necklace, but it worked out well. We took it off while she slept, and kept it under her shirt most of the time. It works by releasing some kind of super soothing amber oil on the skin, or something, so keeping it under the shirt actually helps it work. 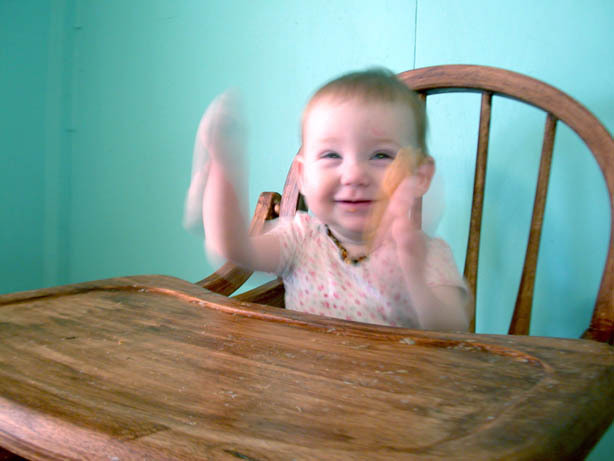 We're in another round of teething, and since she's been biting furniture and fingers alike I've gotten it back out. Here she is eating sweet potato pancakes while wearing the necklace. Yeah, she's pretty cute. I'm a Baltic Amber fan & so happy to see it helped your little one out! We had a similar experience. My daughter started teething at 3-months...every nursing session was a nightmare...she refused to latch. I was terrified the teething was going to cause a strike. Ordered a necklace, 20 minutes after putting it on it was like a different child! She has worn it almost constantly since then. Even sleeps in it. The first tooth didn't show up till 9-months! And now at 19-months she has a whole mouthful of teeth and it has been relatively painless because of the amber. I have found them to be great for my baby's eczema! He has had persistent mild eczema on his face and the amber necklace cleared it up overnight!